Desipramine Hydrochloride Overdose is the accidental or intentional intake of the drug, in dosage higher than the recommended/prescribed value. What is Desipramine Hydrochloride Overdose? What are the Causes of Desipramine Hydrochloride Overdose? What are the Signs and Symptoms of Desipramine Hydrochloride Overdose? The signs and symptoms of Desipramine Hydrochloride Overdose can vary from one individual to another. It may be mild in some and severe in others. Several systems of the body, such urinary system, respiratory system, vascular system, digestive system, nervous system, and ENT may be affected. How is First Aid administered for Desipramine Hydrochloride Overdose? Who should administer First Aid for Desipramine Hydrochloride Overdose? 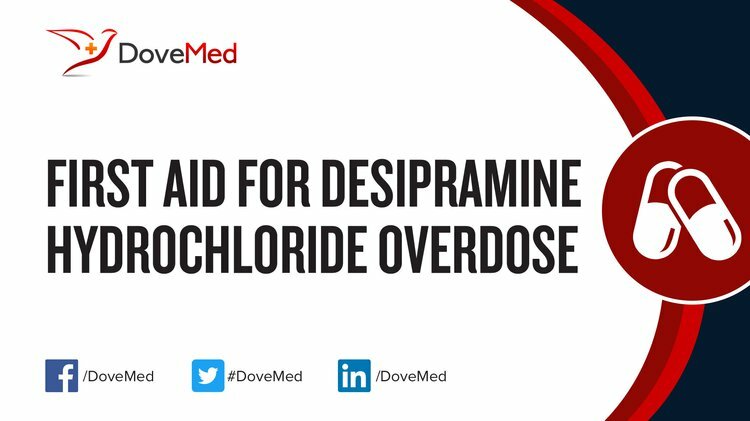 First aid for Desipramine Hydrochloride Overdose is administered by healthcare professionals. What is the Prognosis of Desipramine Hydrochloride Overdose? Desipramine Hydrochloride Overdose can be a life-threatening condition. The prognosis is dependent on the dosage of drug taken, the time between overdose and treatment, severity of symptoms, and general health condition of the individual who overdosed. How can Desipramine Hydrochloride Overdose be Prevented? Holm-Denoma, J. M., Witte, T. K., Gordon, K. H., Herzog, D. B., Franko, D. L., Fichter, M., ... & Joiner, T. E. (2008). Deaths by suicide among individuals with anorexia as arbiters between competing explanations of the anorexia–suicide link. Journal of Affective Disorders, 107(1), 231-236. Poling, J., Oliveto, A., Petry, N., Sofuoglu, M., Gonsai, K., Gonzalez, G., ... & Kosten, T. R. (2006). Six-month trial of bupropion with contingency management for cocaine dependence in a methadone-maintained population. Archives of general psychiatry, 63(2), 219-228. Vujic, Z., Radulovic, D., Lucic, B., Eric, S., & Kuntic, V. (2003). UV-densitometric determination of maprotiline, desipramine and moclobemide in pharmaceutical dosage forms. Chromatographia, 57(9), 687-689. Syeda, A., Mahesh, H. R. K., & Syed, A. A. (2005). 2, 2'-Bipyridine as a new and sensitive spectrophotometric reagent for the determination of nanoamounts of certain dibenzazepine class of tricyclic antidepressant drugs. Il Farmaco, 60(1), 47-51. Wismer, T. A. (2000). Antidepressant drug overdoses in dogs. Veterinary Medicine, 95, 520-525. Mohamed, F. A., Mohamed, H. A., Hussein, S. A., & Ahmed, S. A. (2005). A validated spectrofluorimetric method for determination of some psychoactive drugs. Journal of pharmaceutical and biomedical analysis, 39(1), 139-146. Caruso, F. (2001). U.S. Patent Application No. 09/966,975. Oztunc, A., Onal, A., & Erturk, S. (2002). 7, 7, 8, 8-Tetracyanoquinodimethane as a new derivatization reagent for high-performance liquid chromatography and thin-layer chromatography: rapid screening of plasma for some antidepressants. Journal of Chromatography B, 774(2), 149-155. Wang, S., Zhang, Q. J., Liu, J., Wu, Z. H., Wang, T., Gui, Z. H., ... & Wang, Y. (2009). Unilateral lesion of the nigrostriatal pathway induces an increase of neuronal firing of the midbrain raphe nuclei 5-HT neurons and a decrease of their response to 5-HT 1A receptor stimulation in the rat. Neuroscience, 159(2), 850-861.